Specifically developed for unruly, curly hair, the Discipline Curl Idéal Cleansing Conditioner from Kérastase works to tame and smoothen locks for salon-style results. Fortified with an innovative blend of Cationic and Amphoteric Surfactants to gently eliminate impurities, whilst Pro-Keratin and Hydrolysed Elastin strengthen fibre and improve manageability. Infused with Lipid Compounds, the lightweight conditioner deeply nourishes and hydrates strands from root to tip, leaving curls calm and defined with enhanced shape. Apply 4 to 6 pumps to wet hair. 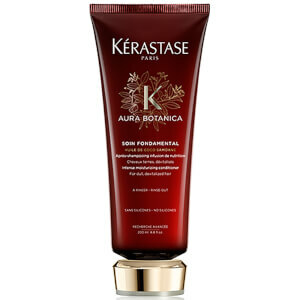 Distribute evenly from the scalp to the ends. Leave on 2-3 minutes. Emulsify with a little water. Rinse thoroughly.